As somebody that can seriously struggle to sleep on a regular basis, I love giving new methods and products a try. From sprays and scents to certain bubble baths and stepping away from screens I feel like I’ve tried it all. The simple reality is I struggle to relax and unwind my mind when it comes to attempting to sleep. Just a few days ago I was woken up by some emergency roadworks outside and that was it my mind was off thinking about a hundred things instead of helping me drift back off peacefully. No products, routines or apps are going to be a cure for that and the worries in life but they can help give me a nudge in the right direction. The packaging for this spray bottle reminds me of a lot of Avon linen sprays which is perhaps unsurprising as that’s ultimately all the product is. I tend to spray it on the top of my bottom pillow as I find the spray directly on my top pillow to be slightly overwhelming (and it doesn’t dry into the material that quickly so I don’t like the idea of resting my head on a damp scented cover). 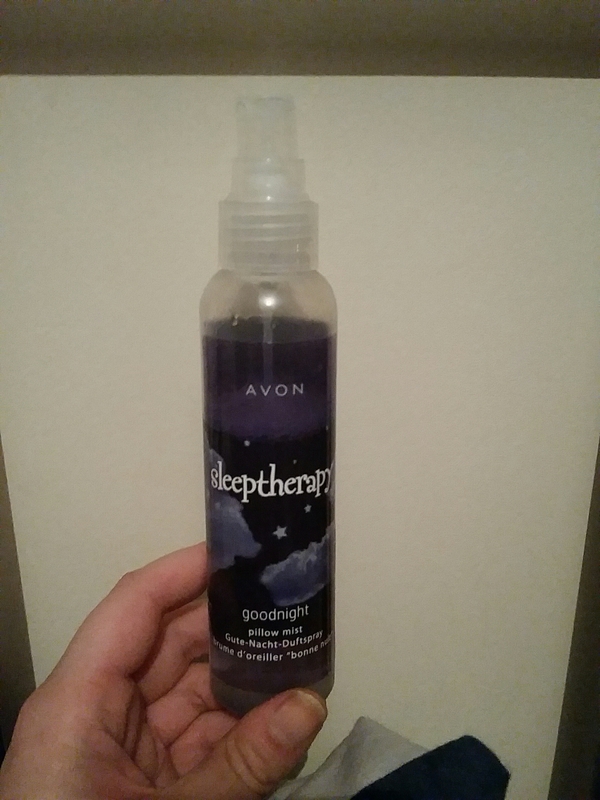 It claims to smell of lavender, as most sleep related products tend to because of its ‘qualities’, but if I didn’t know that was what it was supposed to smell of I honestly wouldn’t pick up on it. I normally like things that come in this shape tub, such as Body Shop lip balms, but I find this (seemingly discontinued) product in this tub to be pretty stressful. The product itself is fairly solid and whilst I don’t have long nails the balm gets underneath them so easily because getting it out involves a lot of pressure. I think it’s because I keep it in a cold environment but it is super rigid until applied to the temples. I like the scent of this product as it isn’t too strong and as it gets massaged into the temples that’s really important. For both products though I don’t think they help as much as they might claim to. The balm itself helps me to relax but so does just massaging my temples in a circular motion without any product. The spray is good and does soothe my thinking but again I feel a cheaper linen spray or other lavender aroma producing product would be just as effective. I wouldn’t go out of my way to purchase these two items but I know some people that swear by them. 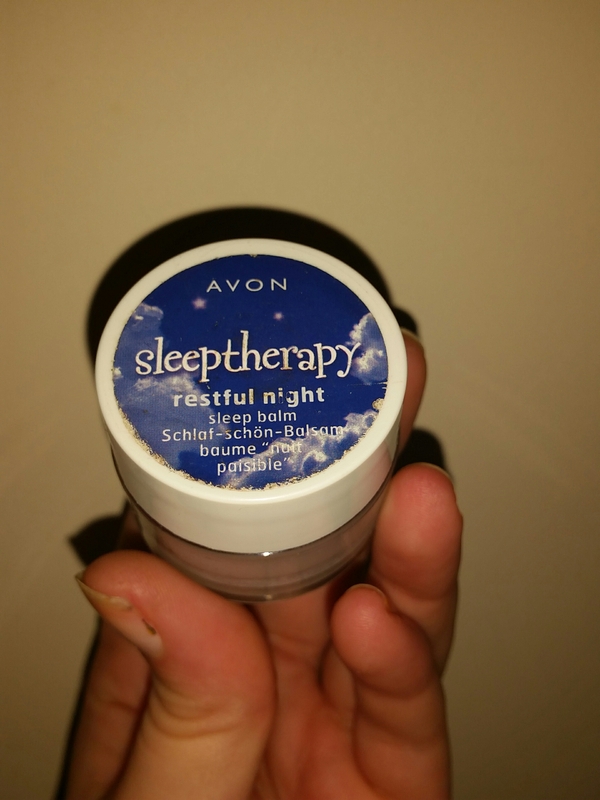 When I was an Avon representative a woman used to buy SO SO much of all the Sleeptherapy products because it was apparently the only way her husband could A) sleep and B) not snore. But they’re part of my current evening routine so I might need to find something to replace them with when the time comes. This entry was posted in Lifestyle, Products For The Home and tagged aroma, avon, balm, bblogger, bbloggers, Beauty, beauty blogger, beauty bloggers, beauty product, bed, bedding, calming, flowers, habit, lavender, lblogger, lbloggers, Lifestyle, lifestyle blogger, lifestyle bloggers, linen, mind, nighttime, pillows, routine, scent, sleep, sleeptherapy. Bookmark the permalink.